Errol: Debs sent me this! And I’m actually all queued up for comics for this week. I sure hope nothing fun happens that needs to be comicized. 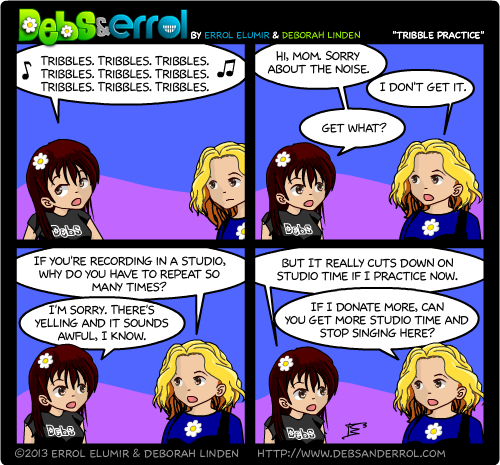 Debs: Okay, my mom didn’t really say what’s in the last panel, but she was wondering why I was constantly repeating things (I’m staying at her place these days and the sound was floating up from the basement). And she was only around for 5 hours of it 😛 My brother had to endure quite a bit more. I am so tired the grammar in the third panel is making no sense to me. You actually want nothing fun and comic worthy to happen? Who are you and what have you done with Errol? Oh, I figured that was me. I’ve been novel editing for days now, and had just come off a three or four hour stint. Everything was starting to look odd.